Master C.V.V. (Canchupati Venkatrao Venkasami Rao) was born on 04AUG1868 at 10:20 A.M. Dhanishta nakshatram at Ammal satram, Kumbakonam, Tamilanadu, India. Master is a very benevolent person from the beginning. If any corpse seen by him, his heart pelipitated like deer’s eyes. To avert the death, He tried so many ways. He tried Louis Kuhne books. Louis kuhne wrote so many books on “Diagnosis of the state of disease and New Science of Healing” publi-shed on 1897. It seems that he has tried and not satisfied with that treatment also. After all these events C.V.V. joined in the Theosophical Society. He became a inner circle member. Their theory also referred to astral body only but not for physical. Their theory also not given the satisfactory answer to C.V.V. He came out of the Theosophical Society and he thought to start a New Yoga, different from all Yogas. All yogas and all societies are running in one path, Master CVV Yoga is running in another path. He started first with his Grand Father, Father, First wife, first wife son and his close friend S.Sundaram. He started the practice. One day ‘Mahatma’ i.e. One Point appeared before him. If you obey my instructions, I will give the powers to prevent the death. Happily he accepted the offer. Mahatma gave the folowing :- You should practice as per my wishes and my biddings, following my rules and regulations and instructions with pure heart, with diligent faith, with implicit obedience, without flaw. The practice should be done uninterruptedly. I will give you necessary instructions for your daily progress to achieve this goal. If you fail to obey my instructions, I will with draw my promise. Then what will be your fate? Think over. C.V.V. accepted his biddings, commenced with the above members. After some days, the first wife left her physical. The death of first wife gave a severe shock to Him. To continue the process of this Yoga, wife is essential. The first half of creation theory is to be experienced through wife only. To experience that and fulfill his desire(to conquer the death), he married second time. He experienced the Creation theory, but the child left his physical. From the date, he vigoursly tried his level best to establish the Human Body as eternal one on this Earth. He pressed the Mahatma, why these are all happened? There was no reply from him. The prana supplied by Mahatma was temporarily restored his son’s life but not permanently. When temporary prolongation of life experienced by CVV. He thought that permanent restoration of life also posible on this Earth. With that hope, he continued his practice and he cured so many(4,448) diseases. The lives of so many people were saved by the revered and worshipful Master CVV. “This is a Society enabling all to enjoy all the Siddis, obtainable by Yoga, in this physical body and in full consciousness state. I have given you directions, symbolic ways for your development. You must try to learn the meaning of these symbols and then question me, if you have any doubts. For example,a doctor may prescribe a medicine in the symbolic style “mix up 5, 9 and 7″. You cannot write the above numbers in water and give it as the medicine”. The Mahatma gave the Master all in symbolic ways as aforesaid. If any difficulty arises, he used to consult Mahatma to get over this hurdle. He gives a temporary adjustment to overcome that. In the same way, whenever difficulty arises, He consulted the Mahatma. He gave so many symbolic ways for each medium development. According to their practice development, higher and higher adjustments were despatched by the Mahatma. 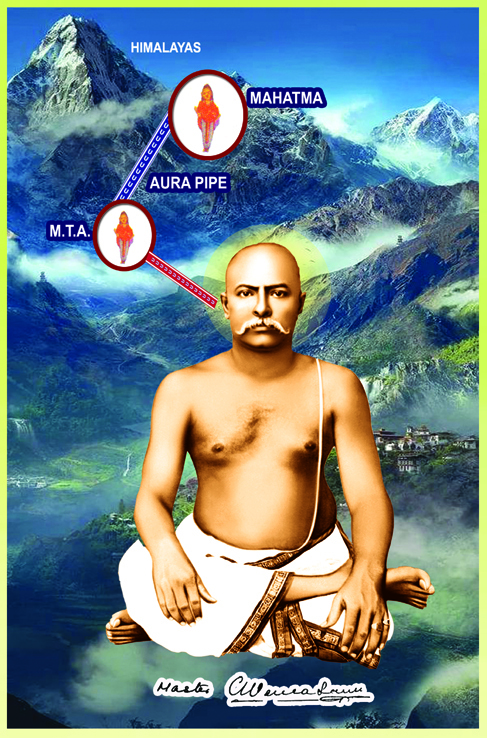 After the practice, as per the orders of the Mahatma the progress observed with one another. Sometimes it works in some one, it may not work in some one. After rectification, the next higher regulations was given to the mediums. The Planets, Rishis, Devathas, Nakshatrams etc. are controlling the Earth and human bodies. They are very powerful. Master thought they must be regulated first, then Earth and Human body. Before that, it is highly impossible to establish the eternity for the human body. Therefore, He regulated all the above and gave Horn Cover to the Earth. The purpose of ‘Horn Cover’ is to prevent the Earth from collapse. In around 1930 the average life of a human being was below 30 years. MASTER C V V said, ”the manthras like Ambrosia were spread in the cosmos. It is working in the cosmos.” According to the Master’s wordings the Ambrosia is spreading on the human beings without their knowledge. Therefore, the present average life of a human being is raised to 60-80 years.